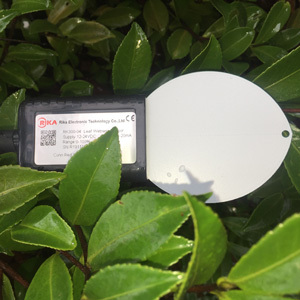 The 260-RK300-04 Leaf Wetness Sensor is a useful tool for monitoring leaf wetness. The sensor provides accurate measurement of trace moisture, fog, mist, frost, and ice crystal residue. The 260-RK300-04 Leaf Wetness Sensor is a useful tool for monitoring leaf wetness, an important factor in calculating irrigation requirements and in preventing pests and disease. The shape of the sensor blade simulates the characteristics of the leaf surface. By measuring the variation of the dielectric constant of the upper surface of the blade, the sensor provides accurate measurement of trace moisture, fog, mist, frost, and ice crystal residue. Install the sensor with the upper surface of the blade at an angle similar to that of a natural leaf.